Watch the 3 videos above (You only need to watch until the 2:18 mark on the Laurel Burch video.). Read the information below. Tell 2 people something you learned from the reading. 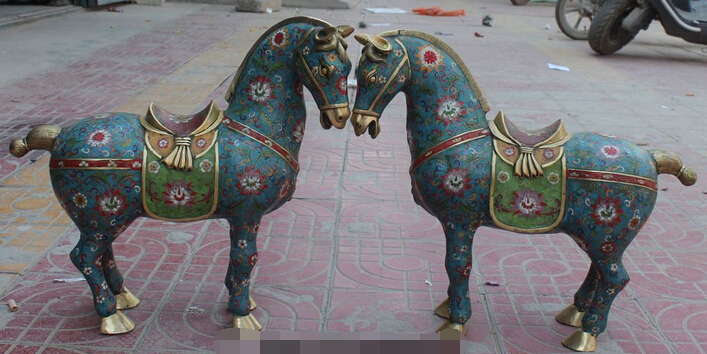 Cloisonné is the technique of creating designs on metal vessels with colored-glass paste placed within enclosures made of copper or bronze wires, which have been bent or hammered into the desired pattern. Known as cloisons (French for “partitions”), the enclosures generally are either pasted or soldered onto the metal body. The glass paste, or enamel, is colored with metallic oxide and painted into the contained areas of the design. The vessel is usually fired at a relatively low temperature, about 800°C. Enamels commonly shrink after firing, and the process is repeated several times to fill in the designs. Once this process is complete, the surface of the vessel is rubbed until the edges of the cloisons are visible. They are then gilded, often on the edges, in the interior, and on the base. She was inspired by the cloisonné work she saw in China. You can see a resemblance to the copper outlines in her paintings. For this project we will be combining the Chinese art form of cloisonné, Laurel Burch's paintings, and the use of animals, bright colors, and patterns that are commonly found in folk art from many cultures. ​Explore both cloisonné and the work of Laurel Burch on line. Use the websites below or do your own research online. Brainstorm ideas for your project including patterns, animals, colors, etc. Write down 10 ideas that may work for your project. Start by creating a test pattern. Below is a close up image from one of Laurel Burch's paintings. On the 6" square provided, paint the pattern trying to match the colors and layout. You are trying to repeat the image as close as possible. Use the tools provided to duplicate the dots. Once you have completed the sample, take a photo and send it to Schoology. After researching cloisonné Art and Laurel Burch, please create 3 or 4 quick sketches of different ideas. This is the planning stage so all ideas can be modified. Some ideas include animals, plants and flowers, people, and pure design. The style should be playful and simplified. These are not realistic drawings. Her designs include one individual image, 2 or 3 images, or a whole bunch of images. They may be sitting or laying down or jumbled in all types of directions. Check out the examples at the bottom of this page for ideas. Patterns - Since the animals, etc are so simple, Laurel Burch filled them with all kind of patterns. You will need to include patterns in your simplified drawings. Plan colors at this time. There is no limited on how many colors you should use since her designs are full of color. Some of the colors can fade to a darker or lighter version of it's self and others can have a muted texture. You can use a sponge to mush two versions of one color together or press saran wrap into the wet paint and slightly wrinkle it up. Pull the wrap off to leave a pattern. This is the final product. The directions are listed below. If you have a brilliant idea that reflects cloisonné art but doesn't follow the criteria, see me and we can discuss how we can make it happen. Draw your final design on newsprint. It will be transferred to your final paper. Add a thick line around all of your shapes and designs, as well as, outlining your image to mimic the look of cloisonné. Draw to scale. This should be the final size. If you are using white paper, you can place your drawing underneath the final paper to transfer the image. Your design may be placed on white paper or black paper. The white paper will make your colors clear and bright. The black paper will mute the colors slightly but set an interesting mood. Experiment on scrap paper before you decide. Make sure you base coat colors with white primer if you are painting on black paper. The black paper takes a little work but the final effect is worth it. You can also use gold or silver acrylic to your design or you can use metallic paint for your outlines. Go back over your work and look for areas that need improvement. This would includes things like erasing pencil lines, fixing painting mistakes, etc.